Ordered a GLC63 in July, car is at VPC in Long Beach Ca since 10/3/18. Dealer called me and doesn’t know the hold up as it’s not emissions. I live in AZ so it’s not CARB issue. Seems they are holding all 63’s. Anyone hear different? that's basically the premise of this thread. 2019 Mercedes GLC63 AMG is not yet release by Mercedes USA. Lol. Us over on the E63 forum are in the same boat. My Wagon has been at the Long Beach VPC since September 8th. nobody is waiting a year. 2019 orders started in June. Not everybody got a June allotment. I thought i had read some folks had put in there orders in last december? it would be a 2018 order and 2018 cars were released in May. you have to understand that all dealers have allotments that would be built at a specific date. If a dealer takes money from you in January for a 2019 build,, they do not have allotments yet. 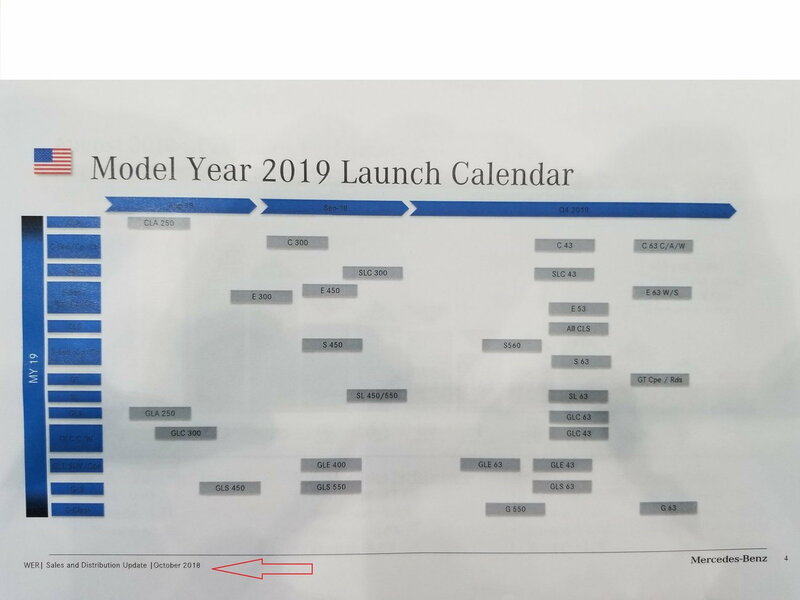 I believe 2019 allotments started in June so a 2019 model would officially have been ordered in June. In my case, I was originally on an October allotment, then a September allotment was able to add HUD, so i moved to the September allotment. Car arrived stateside September 24th. Some wait was expected and at the current time, I have not exceeded the time I knew I was going to have to wait. Waitng until december would be a different story. Is there an AMG GLC 63 S SUV available for the USA? I swear ive seen it on the internet. But my dealer says no. MB and AMG websites are conflicting. try here ....some may be spoked for orders? Not in the US unfortunately for the wagon. But the coupe there is. I am not frustrated yet but this is really a bad look on Mercedes. Tesla is celebrating selling the most luxury cars in Q3 and from what I see, it is because Mercedes basically did not deliver cars in September. I was a little irritated at first, but it didn't bother me too much. I'm starting to feel pretty ticked off about it now. Feels pretty unnecessary and like they don't care about their customers. At least send me a nice letter telling me my car will be delivered soon, maybe include the date of delivery, and include some small token of appreciation for our patience. I too am frustrated and disappointed. Dealer stated it would be here in August (Long Beach VPC mid-August). Then to be delivered in September. Then early October. All this time the MB(USA) charts show November. Patience is one thing. Being misled is something else. This is not what I expect from a premium brand such as Mercedes. I find myself reassessing my decisions weekly and looking at other options. Very sad since this really is my first choice. your dealer sales rep is bad. at least my dealer did not give me bad info. just Mercedes playing games at this point. As much as I would go somewhere else if i was done waiting, there are just no real options for me with price and performance. At least you're not waiting until December like us E63s future owners. If that's any consolation. Last edited by Pertplus; 10-22-2018 at 06:55 PM. While getting the deposit back at Mercedes, they said the car will get in by December, so if you are looking for a 2019 GLC63 SUV with a somewhat acceptable 2013 tech that will get updated next year (start crying! ), there is one available in San Francisco to put your name on. what exactly is the 2013 tech you speak of? it is when the tech on the GLC was signed off for production, it was pretty good back then, but 2019... mehhh, the C got the upgrades, with digital cluster and bigger screen (touch I believe), the GLC will get it next year, I was expecting it for this year tho, too bad. I drove a x3 m40i a couple weeks ago and it was a fun car .Good sound and the sport modes worked really well along with the new tech. I wanted the v8 and was waiting for the glc63 but got concerned with the lack of information from the manufacture so went with an x5 50i msport. did cost more 104k by the time i got done with it. Hoping for 43's still by month end..at least the 43 suv's... coupes maybe a week or so after.. just based on talks, nothing concrete.. I was told Nov for C43 amg's even though originally I was told late Oct.. Wheels arrived last. Ordered the lowering module today. I do not know what else to do with myself.